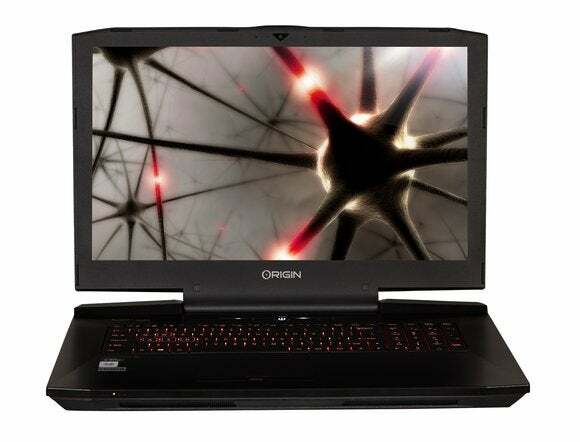 It’s easy to see Origin PC’s new EON17-SLX laptop as a desktop replacement, because it will literally offer desktop-class parts and performance. 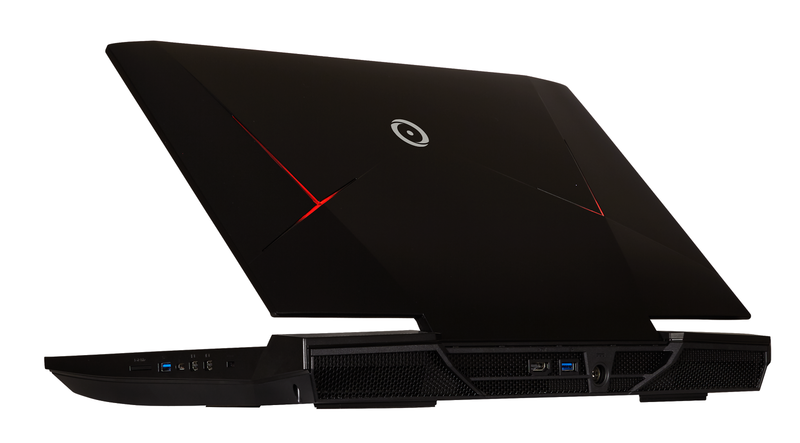 The burly new Origin EON17-SLX packs in Nvidia’s new GeForce GTX 980 mobile GPU that offers 1:1 performance with the desktop graphics card. And beyond the graphics, Origin PC once again pulls the same trick it did with EON15-X by skipping Intel’s mobile quad-core CPU for a full-blown desktop chip. Inside the EON17-SLX you’ll find none other than Intel’s high-end Core i7-6700K Skylake chip. Origin PC didn’t say why it chose a desktop chip, but there can be a big advantage to a desktop chip over a mobile CPU: sheer performance. The clock speeds on the desktop Skylake start at 4GHz and run up to 4.2GHz. The comparable Core i7-6820HK that’s being used in other gaming laptops starts at 2.7GHz and tops out at 3.6GHz. If you want to dive into the gory details on Intel’s ARK comparison tool, I’ve lined up the chips here. The other advantage of the desktop part is the use of a socket. Intel offered its high-wattage quad-cores Haswell chips for laptops in a socket, but did away with the practice with Broadwell CPUs. Skylake continues the practice—which means no more socketed parts in laptops that use mobile chips. But with the EON17-SLX and its socketed desktop processor, you could swap out the chip if you wanted to. I spoke with vendors about concern over the shift in Intel’s offerings some months ago and most thought it just wasn’t a big deal. Maybe 0.001 percent of buyers are interested in laptop CPU upgrades, so the general consensus was it didn’t matter if the CPUs were socketed or soldered to the motherboard. The disadvantage in using a desktop chip in a laptop—besides price; the EON17-SLX starts at $2000—is power consumption. The Core i7-6700K is a 91-watt part vs. the mobile chip’s 45-watt TDP. That means you could have to run from power outlet to power outlet just to get from the living room the office. But who are we kidding? You don’t buy this class of gaming laptop to tote it down to the cafe where you can work on the Great American Science Fiction novel while sipping on a latte. It’s mean to be run on AC and stay that way for 95 percent of its service life. Other amenities in the EON17-SLX include USB-C with support for USB 3.1 data rates, Killer NIC’s E2400 part, up to four storage devices, a backlit keyboard, and 64GB of RAM. That last thing won’t happen until 32GB DDR4 SO-DIMM modules are available though. Origin said it will also offer the choice of a single GeForce GTX 980 with 8GB frame buffers or two—repeat two—GeForce GTX 980m cards in SLI each with 8GB as well. Before you pass out from swooning, note the “m” at the end of the latter option. Those aren’t the full monte GTX 980 cards but the slightly slower older versions. How fast will that be? 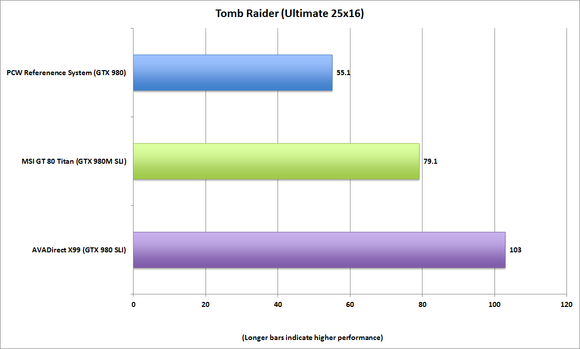 Since the GeForce GTX 980m offers about 75 percent the performance of the GeForce GTX 980 laptop version, you expect the SLI to win. The same graphics set up was used in the MSI GT80 Titan SLI and it spanks a single GeForce GTX 980 setup. Don’t believe? Here’s how the MSI handled the desktop parts. GeForce GTX 980m in SLI > GeForce GTX 980. 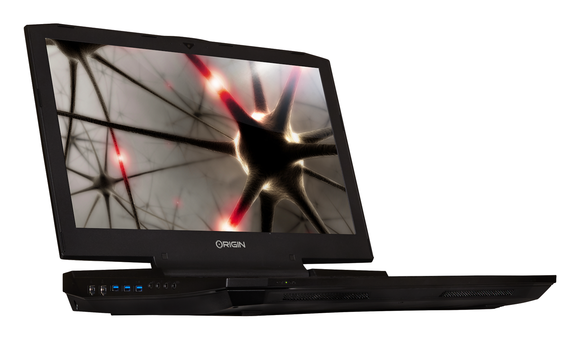 For a display, Origin PC uses a G-Sync 17.3-inch panel at 1920x1080. While G-sync is great, one issue with the current panels is that the graphics powering them are pure overkill for most games. G-sync works best at lower frame rates in the range of 30 to 50 frames per second and you’ll be hard pressed to see that low a frame rate with a GeForce GTX 980 pushing the pixels out. The advantage of G-sync would play out in a year or three when games are actually dragging the once-mighty GeForce GTX 980 into those kinds of low frame rates. But maybe it’s happening sooner. We’re already starting to see where a variable refresh panel can pay dividends in games like Assassin’s Creek Syndicate, which was plodding along at 45 fps on an even beefier GeForce GTX 980 Ti with all the eye candy crankedd. So yeah, maybe that’s a good choice after all Origin PC. And to head off the inevitable observations: Yes, a gaming desktop is cheaper, more upgradeable and pure joy to build—but you aren’t going to toss it into a backpack and take it to a buddy’s house, are you?